What is the strangest food you ever ate while traveling? Strange maybe for you but not for the locals who lick their fingers for a glass of brennevin and Icelandic rotten shark or plate of raw octopus just caught right out of the Med and slammed to death on the spiky rocks. 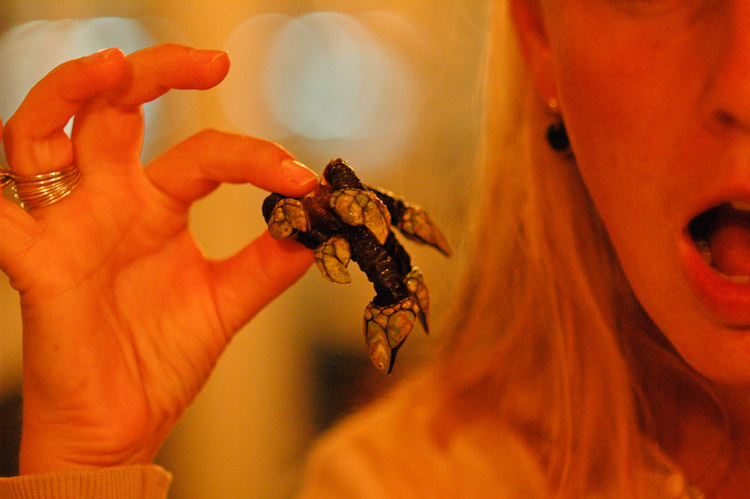 For us, it all began with some percebes, or goose barnacles, in an empty restaurant on a beach near Sintra in Portugal. The owner had a good laugh (while looking up from the tv-screen with football) when we didn’t know how to eat those small creatures. It all adds up to the fun of travel, and of course, the fun of savouring and trying out new food. We contributed to this new book, written by the famous foodphotographer Tony Le Duc, about our strangest and most remarkable foodie experiences. the result is Kook Ze Vreemd, probably the most strange cookbook you will ever come across. Enjoy!